While I was thinking about what to write here, I looked at some of my other comments on this week’s Torah portion, Yitro, and what I wrote four years ago is pretty much what I feel like saying this year, so, if you will indulge me, this week’s comments are from 2011. But I did dig up new humor. But first, Moses gets a very useful lesson in management from his father-is-law, Jethro (Yitro), who, appreciative of the implications of the splitting of the sea everyone’s talking about, has come to the camp in the wilderness, bringing in tow the wife (Zipporah) and two sons of Moses, whom we (as well as Moses?) never hear from again. Jethro observes Moses trying to be a one-man judicial system and not only tells him he must delegate or collapse, but practically hands him an organization chart (names to be filled in), so that only the most difficult cases will go all the way up to Moses. 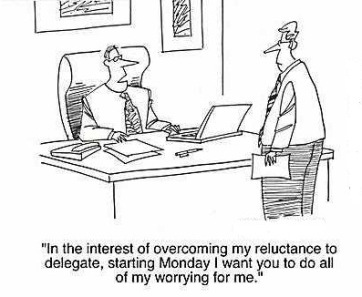 We probably all know people who micromanage and refuse to delegate because they desire control and/or they think only they can get it right. In the case of Moses, a truly humble man, it is likely that he simply wanted to help the people who came to him, not turn them away. I have written elsewhere in these missives that I think the Children and Israel are inadequately prepared for the wonders at Sinai, subjected to thunder, lightning, earth tremors, and of course a very loud voice of God, and that, because their fear prevented them from fully hearing and appreciating it, this helps plant the seeds of doubt that lead to disaster later. This year, I appreciate that many pains are taken beforehand. They have several weeks to recover and decompress after escaping from Egypt. They are exposed to only a few laws to deal with at a time. They are given manna as sustenance and a means of developing faith in God. And they are told that God wants to have a special relationship with them, that God bore them on eagles’ wings out of Egypt. They are to be a treasured possession and a kingdom of priests and a holy people. (All they have to do is obey.) They are told how to prepare physically three days ahead of time. But the Revelation at Sinai still overwhelms them. About the eagles’ wings: Nechama Leibowitz reviews several commentators’ takes on this in her book, New Studies in Shemot, vol. 1, pp. 290-302 (some of the text is at http://www.ramahwisconsin.com/site/epage/56422_697.htm , the top half, and it may be available elsewhere online). “…I bore you aloft on eagles’ wings” (19:4) is an image of love and compassion, of eagles carrying their fledglings on top of their wings, soaring beyond the earth. But the words that follow are at least as important: “and brought you unto Myself.” The Exodus was not so much from as to, i.e., from slavery in Egypt but, more importantly, to the service of God. I don’t have a problem with delegation. I love to delegate. I am either lazy enough, or busy enough, or trusting enough, or congenial enough, that the notion leaving tasks in someone else’s lap doesn’t just sound wise to me, it sounds attractive. 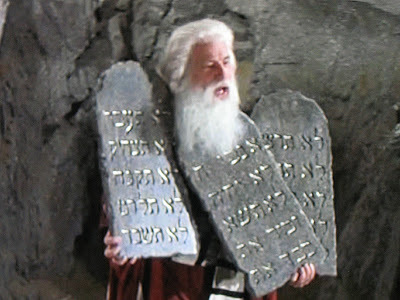 One of Mel Brooks’ funniest bits is a scene from his 1981 film A History of the World: Part 1, in which Brooks, in the role of Moses, comes down from Mount Sinai carrying three tablets containing 15 commandments, only to drop one of the tablets, losing the last five commandments as the tablet shatters into bits. 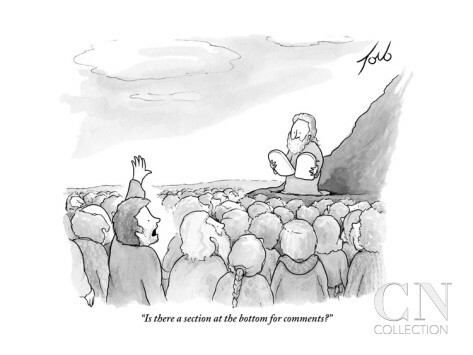 The scene is short, and the third tablet containing the five lost commandments is visible for only a few seconds. We always assumed that the writing on the tablet was some random Hebrew letters, because we never got a good look at them. On Monday night we watched the PBS tribute to Brooks on American Masters, on which they played this clip. Seeing it on a 55 inch screen in high definition, all we had to do to read the words on the tablets was to push the pause button. And there they were — the long lost shattered five commandments. Here’s a translation of the five: You can interpret them any way you want — that’s what we’ve been doing to the surviving Ten Commandments for thousands of years. But our favorites are Lo Tatzkhik or Lo Titzkhak – obviously an inside joke by the Brooks crew,Lo Tikneh – perhaps the basis for not buying retail, and Lo Teshaber – irony of ironies – as the tablet fell to the ground and broke into tiny pieces. 12. Lo Tatzkhik – You shall not make people laugh or Lo Titzkhak – You shall not laugh. 13. Lo Tikneh – You shall not buy. 15. Lo Teshaber – You shall not break. This entry was posted in Uncategorized and tagged delegation, eagle's wings, Exodus, Moses, Ten Commandments, Yitro. Bookmark the permalink.